Lee vs Rivera: Who wins? Iowa wrestles Northwestern on Sunday, January 27, 2019 @ 2PM. Who wins at 125 pounds? I vote Lee. For those who think it’s Lee what’s the score. I say tech fall. I’m bold. After this match we'll have a pretty good idea about how good Rivera really is. Bresser wins the match between Lee and Rivera. Did the last match not count? Or are we talking Lee post flu? It counted. As a wrestling fan in general, I took the result with the proverbial grain of salt. I assumed Lee was off his game (Dustin Schlatter losing twice as a soph at Ironman comes to mind) due to unknown reasons. I respect Rivera and if he wins again or simply has a really good match with Lee one can say they're really close or that Rivera is better. I've got Rivera having a legit tweak....not wrestling Sunday...sending the boards into a frenzy....accused of ducking to save his seed. Rivera. He becomes national champ while Lee ends up DNP. I could see him losing to guys like Picinnini this year too (someone he destroyed last year). Lee still seems off. His comments after the Russell match have me worried. I think Rivera gets him again this time but I'm really hoping Lee turns it around by Big Tens. He said, "I have to believe in myself more" which tells me he's having some sort of confidence/mental issue. Also said, "People don't know what you're (I'm) going through and everyone has something they're fighting through". So he's obviously going through something. DNP is a pretty big stretch. You're only saying that because you're still mad about Suriano losing to him. No, he just isn't the same guy, he had a hard rosd through nationals last year. He doesn't look like that now. Doesn't he wrestle Nick P soon? Lets see how that goes as a test. I'm not a fan of either but last year that was all Spencer. The way he's wrestling right now Picc could surely beat him but there's no way there will be 8 guys better than him come March. Rivera ends up 4-0 against Lee this season, no hodge for Bo or Nolf this season. If Lee is having confidence issues I wonder if another loss to Rivera here breaks him. People are talking about Rivera not showing up but is it possible we don't see Lee show up to this match until B1G? There isn't anyone else at 125 for Lee to worry about at big 10s so a #2 seed really doesn't hurt that much. Spencer Lee reminds me of Jesse Janzsten who used to wrestle for Harvard. I watched him win 4 NY state titles by pinning virtually everyone with a tight waist / arm bar. He finally won an NCAA championship before he graduated college. Spencer has the same move with the same success. For me personally, I find a wrestler like this boring. It’s his signature move with no other major offensive in his arsenal. Sebastian figured out how to get to his leg as well as preventing tilts from Spencer. Sean Russell figured out how to prevent the tilt which is why Lee only won by 3 points. 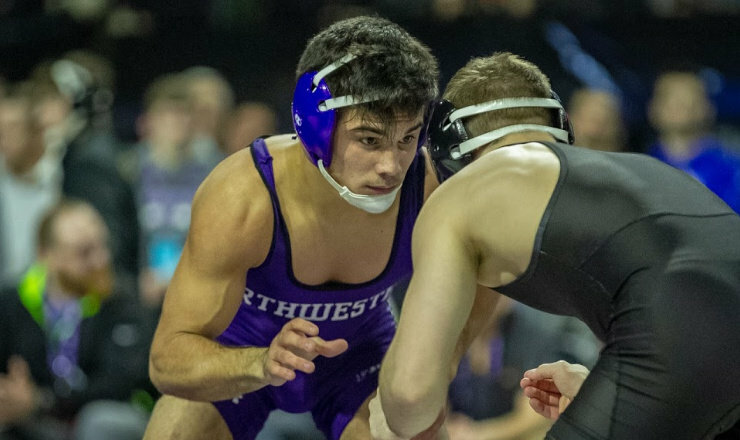 Spencer Lee has been figured out which is why he will not defeat Rivera, this weekend and future matches ahead. I also predict he will not win another NCAA championship with Rivera in the same weight class. Just one man’s observation / opinion. not "showing up" or "ducking" really diminishes my enthusiasm for the sports. You either wrestle or you dont wrestle at all. Hmmmmm. I'd normally pick Lee in a heartbeat, and I think he is the better wrestler, but from everything everybody is saying Lee is "off". Did you see what Lee did to Picc last year at NCAAs? He BROKE him. Picc is having a great year so far, but he's still not wrestled any of the top guys at his weight yet. I'd love to see Picc beat Lee, but man, I think Lee got into Picc's head last year with that whupping. How could he not?